The ESP8266 has seventeen GPIO pins numbered zero to sixteen. However, not all these are exposed on breakout boards because the ESP8266 uses some of them for its own purposes. Further, some pins have limitations that may affect how you can you them. As a consequence of this, you may find that you run out of pins. A summary is below. GPIO0 D3 GPIO0 is pulled high during normal operation. GPIO2 D4 Connected to the on-board LED. GPIO2 cannot be low at boot time so be careful what you connect to it. GPIO6 Used internally to connect the flash memory chip. GPIO7 Used internally to connect the flash memory chip. GPIO8 Used internally to connect the flash memory chip. GPIO9 S2 Used internally to connect the flash memory chip. GPIO10 S3 Used internally to connect the flash memory chip. GPIO11 Used internally to connect the flash memory chip. GPIO15 D8 GPIO15 is always pulled low so you can't use the internal pull-up resistor. Bear this in mind when using it as an input. If you need more pins that the 6-9 that are likely to be available you can connect a Microchip MCP23017 16-Bit I/O Expander with I2C interface. The MCP23017 has two banks of 8 GPIOs; each pin can sink or source up to 25mA subject to a chip limit of 150mA sink on VSS and 125mA source on VDD. It can operate on voltages between 1.8V and 5.5V. 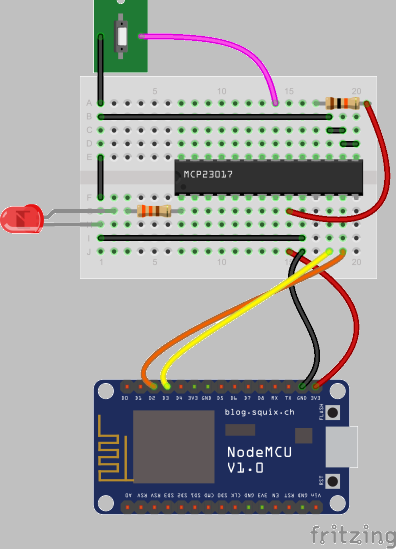 Its I2C base address is 0x20 but this can be changed by connecting combinations of A0, A1 and A2 to 3.3V enabling up to eight devices to be used on a single I2C bus. The RESET pin on the MCP23017 must be tied to VDD using a 10kΩ resistor. If you do not have this in place the chip may stop working or exhibit strange behaviour. You must ensure that each I2C address pin is provided with an external bias and is tied to either ground or 3.3V. This is unlike some other devices where you can use the default address by just leaving the pins unconnected. If you leave any address pin unbiased the address will float and your program will not work reliably. Link to source code. You'll probablyneed to add the MCP23017 library to your IDE. Go to Sketch -> Include library -> Manage libraries and then search for MCP23017; select the Adafruit library and then click Install. Here is the wiring layout. The example has a push-button on GPA0, which is pulled high by the software. The push-button connects to ground. The LED is connected to GPB0 and is in series with a 330Ω resistor. The program flashes the LED on and off; pressing the button pauses the sequence until it's released. The MCP23017 is similar to the PCF8574 that is found on the I2C backpack on LCDs. The PCF8574 has only 8-bit capacity whereas the MCP23017 is 16-bit. Do this with an Raspberry Pi or an Arduino.